A Garden Designed To Blur The Lines Between Inside And Out | The Decor Cafe | Interiors. Gardens. Lifestyle. Home business. 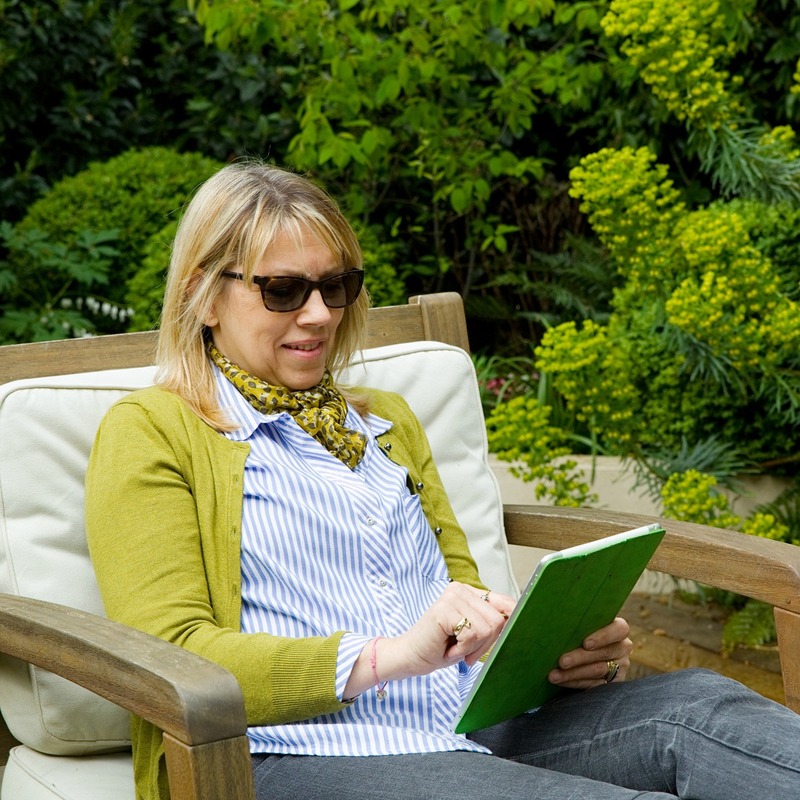 Garden designer Shelley-Hugh Jones tells the story of how to create a garden design that works with a contemporary extension and flows from the inside out. This large 120ft, London garden was completely over-grown when I first saw it; full of mature trees, saplings, brambles and ivy. In fact I could not see the far end of the garden from the house! It was a big project and one that was subsequently constructed and planted over a few years due to its size and cost. 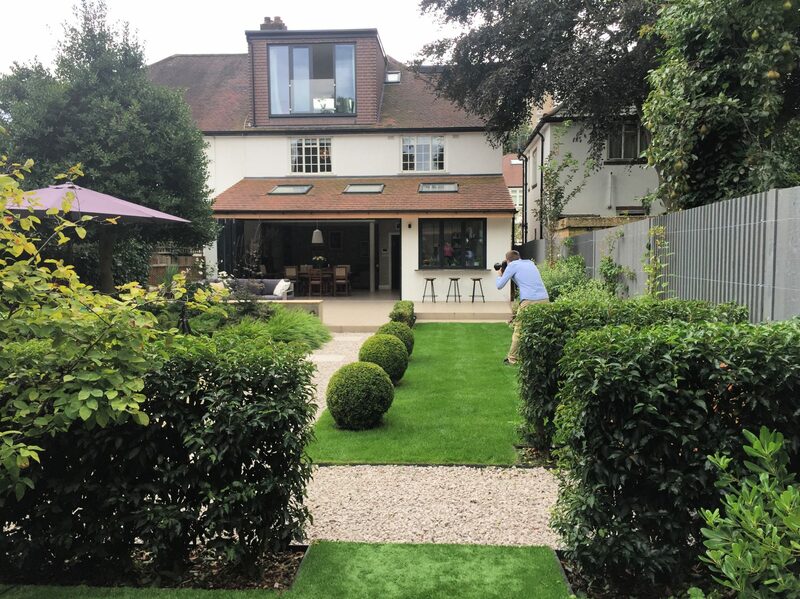 The design and construction of the garden followed a complete refurbishment of the client’s house and as they had installed large bi-fold doors across the back of the kitchen/family room, it was important to create good flow from the inside and out into the garden. Due to it’s size, there was potential to divide it up into areas that would provide space for a garden workshop/storage, a dining area, relaxed seating, planted beds, raised beds for vegetables and ample room for their daughter to play. Once the clients had agreed on the proposed layout, the site was assessed. Some trees were retained but the rest cleared revealing the true size of the garden. 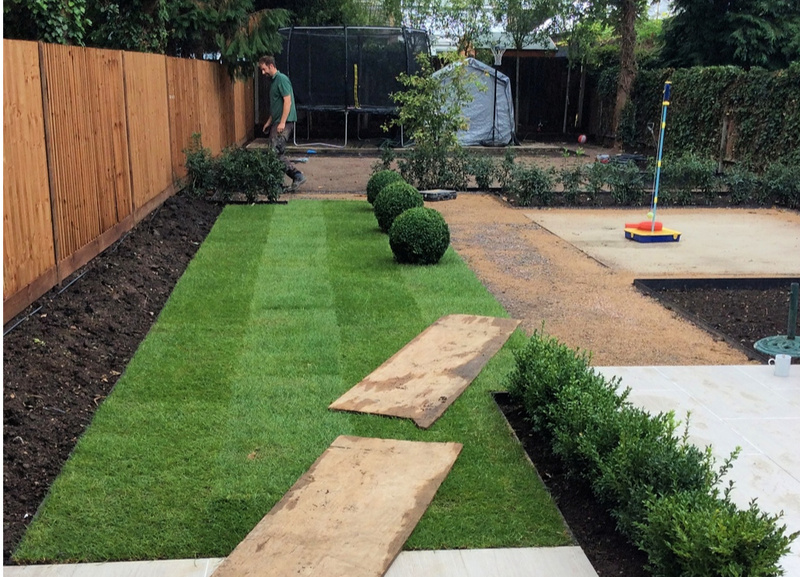 It was divided into approximately 3 areas and the edgings for all the borders, lawn etc were installed. The concrete pads were laid for the paving and garden building, which was to be installed at a later date, plus new fencing was installed. Large standard evergreen trees; Ligustrum japonicum were planted along the back boundary to help hide the row of white terraced houses beyond. Fast growing evergreen hedging; Prunus lusitanica, was planted to create structure and divide up the space so that not all the garden could be seen at one time. This creates a sense of mystery and feeling of space. A specimen Amelanchier lamarkii multi stemmed tree was planted as a focal point at the end of the path, and large areas of planting were created as borders and within the body of the garden which helped to divide the space up, add height and interest. The patio area adjacent to the house was the first hard landscaping to be completed. The same porcelain stone was used inside and outside, creating continuity between both spaces and this made the area by the house a useable space from the outset. 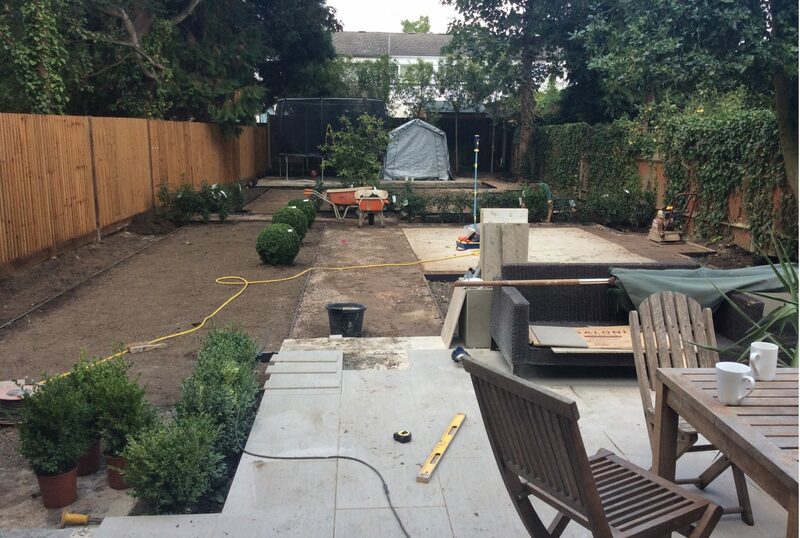 The lawn by the house was laid and gravel was put down along the paths in preparation for paving stepping-stones at a later date. Lighting was installed which adds drama at night and made it a useable space in the evenings as well as during the day. 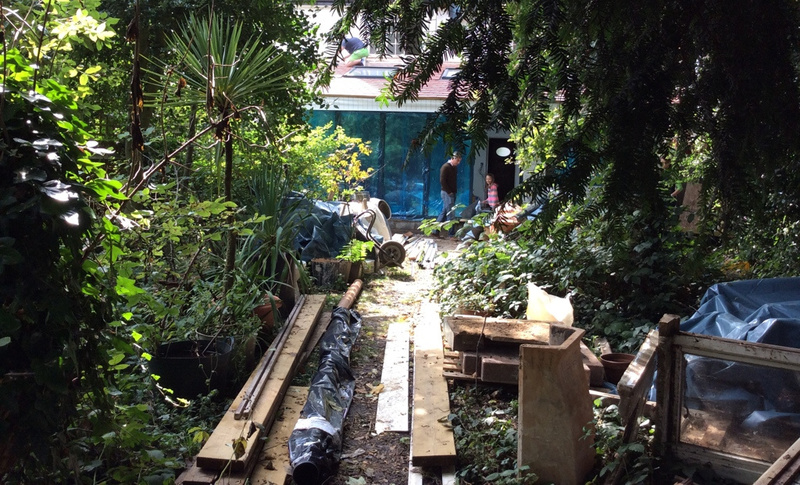 A timber garden building comprising of a storage area and workshop/’man-cave’ was built along the back of the garden and artificial turf laid in front of it which was to house a large black trampoline. (Black helps the trampoline to ‘disappear’, in as much as you can hide a large trampoline!). More planting was added in all areas of the garden; fruit trees, raised beds for vegetables, a specimen cherry was planted on the LHS to balance out the existing large clipped evergreen holly on the RHS and the LHS boundary was fully planted plus other general planting. Sofas and a low coffee table were a stylish addition to the patio. The paving stones on the path leading from the patio were laid and these led to a hidden seating area half way up the garden. 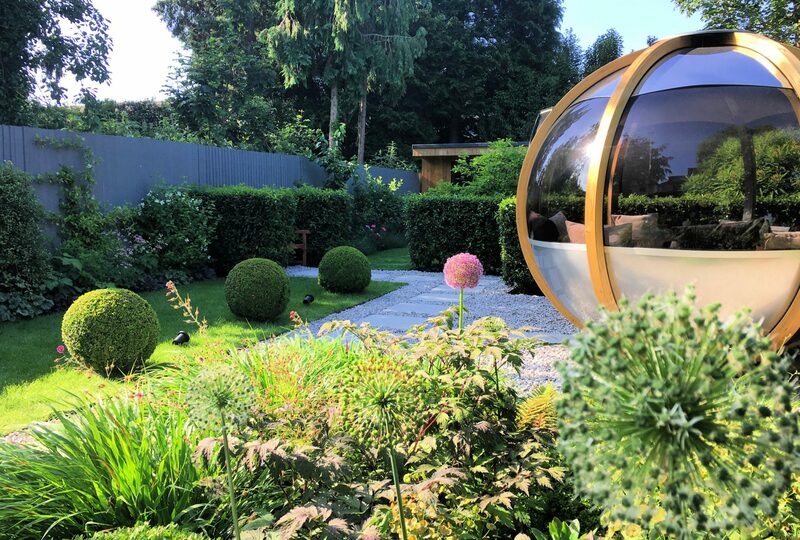 The area used for dining that housed a table, chairs and parasol had a change of use and the clients bought a ‘pod’ that is now housed in this middle terrace and allows inside dining during the day and evenings. It’s also a favourite homework spot apparently! A fire-pit was added to the patio by the house, which provides heat and can be used for cooking as well. The sofa area provides a more relaxed seating and BBQ space. The resulting garden has evolved over a period of years and this extended process has been really fulfilling for me as I have been involved for the entire duration. 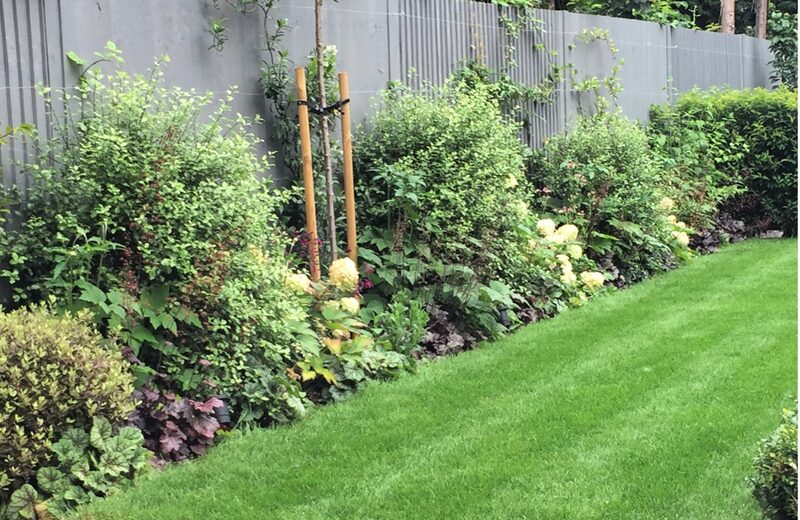 I have had the benefit of seeing the garden mature and together with the clients, decisions about the garden have been made along the way. A garden is ever-changing and requires re-thinks every so often as plants mature and the family needs or use of the overall space changes. The success of this garden illustrates that combined effort. Stunning result that has matured beautifully. Thanks Jo. It’s been great to be involved over a period of years. As you know, A garden is changing all the time- nothing stays the same from year to year. An amazing project Shelley, thanks so much for sharing it with us. It is really interesting and helpful to understand the different stages and thought processes involved in a project like this. A really stunning result. Your clients must be delighted ! Thanks Emma -The clients have become good friends as a result which is an added bonus of this project! 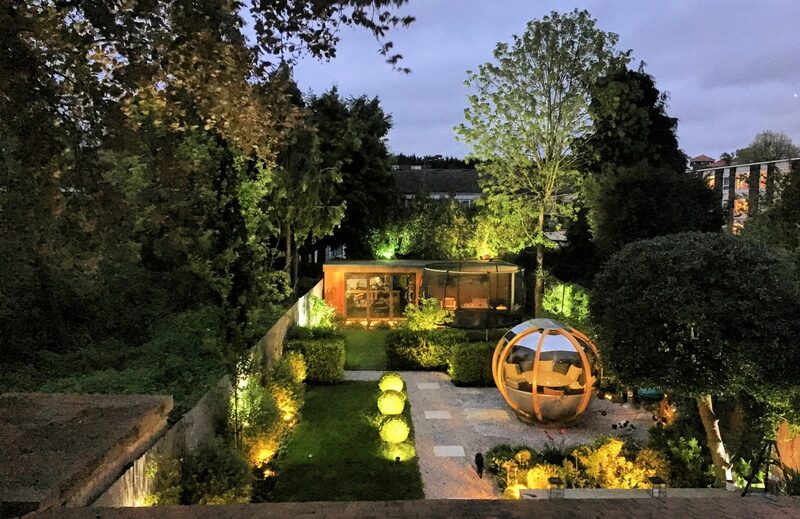 This is gorgeous – I love the outdoor lighting which really highlights the beauty and structure of the garden.